Now I know why people go to film school. It took close to nine weeks for my husband and me to create a one hour and forty-eight minute fly tying video. Then it took approximately another two weeks to figure out how compress a thirty-two gig video file so it fits on a single layer dvd without looking horrible. There evidently are hundreds of possible ways to configure the compression and I tried quite a few of them. They either were too large or looked awful. I was actually shocked when it finally worked. I had burned one more test disk and it worked acceptably on the computer. However the dvd player hooked to the tv had gone berserk a few days earlier. All the sound had turned to horrible static and I had not been to Bozeman to buy a new one yet. However, I thought I could insert the new disk, ignore the obnoxious static, and if I had a picture I could assume the disk would probably work on tv screens, my final hurdle. So I put it in the player expecting one more dud. For a living wonder not only did the video show on the tv but I also heard nice clear audio! We watched the whole thing to evaluate the video. I was worried it would look worse on the tv screen than on the computer. One more surprise in the learning curve for me, it actually looked better on the tv! What a miraculous day, the whole fly tying video fit at last onto a dvd, it worked better than expected, and the dvd player obliged us by briefly providing good sound! The player only lasted through the next movie before it reverted to static again. We are so deliriously happy to have the fly tying dvd finished we really do not care. I designed labels for the dvd and case and promptly started filling orders. Our customers even like it! How much better can life get? Power Streamers is a viable product! I do not recommend picking up a camcorder for the first time and plowing through the project we chose for a first time video effort, but it is possible to survive doing so. My husband and I are even still happily married in spite of the odds. One benefit of this unexpectedly long drawn out process is I can’t think of anything that will scare me in video now. Problems will inevitably come along with new projects, but I have already weathered the worst possible scenario. Prior articles in this series are Hollywood Is Not Threatened and Hollywood Still Is Not Threatened. 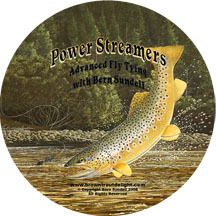 This entry was posted in Creative Projects and tagged fly tying, fly tying video on March 17, 2008 by Lexi Sundell. Lexi, Congratulations to you and yr husband for your achievement, your having learned in the process and having survived as a couple! Pingback: Energies of Creation » Are You Trapped in a Brain Closet?